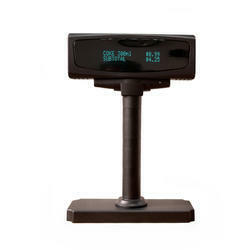 VFD display 2 lines*20 chars Title view angle:30 degree Rotating angle:270 degree Max USB. RD-1200 is a medium-sized pole display that provides your customers clear, easy-to-read information at the fastest data-transfer rate available. It can be freely tilted and swiveled to a variety of viewing angles. With a high-speed data transfer of 115, 200 bps, RD-1200 display is the fastest in its class. It has extremely low energy consumption, using only 2 watts of power. It has an MTBF of 20,000 hours, delivering the outstanding reliability that is critical to high-volume, customer-friendly business environments. Along with the features common to all of our customer displays, the RD-1200 expands your options with serial, USB and pass-through interfaces, four programmable display intensities. RD-1200 can be driven by a single USB port of host device, and remove encumbrance of external adapter. USB driver supports Windows XP, Win7, Win8.1, Win10, Android and iOS operating system, which greatly expanding capability of retail application! Looking for POS Accessory ?